Natural Whey Protein 100% WPI is a key part of our Fitness Pack — now on Special in April for $99! 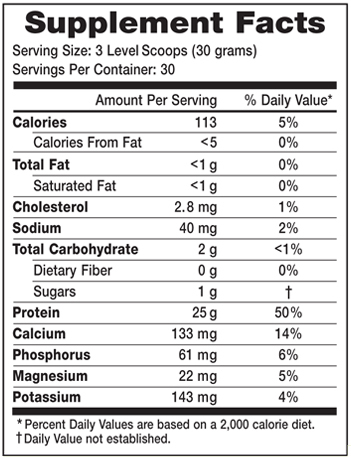 30 Servings Per Container – The ultimate Quality, at the Best Value. But the main reason you should consider whey protein is its digestion rate. Whey protein requires very little digestion, giving you "fast" nutrition for fueling your muscles during a workout, and assisting with recovery afterwards. *Whey protein is often referred to as an “anabolic protein,” since levels of blood amino acids usually peak within 30 to 60 minutes of the protein being absorbed. A whey shake is your better choice for fast-acting protein as compared to whole food protein such as meat, or casein protein found most commonly in dairy products. I've been buying Eniva products for over 10 years now and using the whey protein powder for at least 2 years. It is the lowest carb and sugar whey protein I've found. The flavor is mild and can be mixed with Eniva Vibe and water or your favorite milk or smoothie. Thanks Eniva! Great taste, dissolves/blends well, excellent source of protein. I enjoy it every morning! I love Eniva Natural Whey Protein powder. It's easy to use and I love that there are only 4 ingredients. I like how this turns my thin veggie green juice into a yummy drink. Even my son loves it! This powder mixes well, does not cause any stomach upset and tastes great.